Hadassah’s Dafna Olenik visited the New Jersey Adler Aphasia Center, observing its approach and learning its philosophy. She is now the director of the Adler Center in Jerusalem. Elaine Adler reported that the manual developed by the Connect Program of London was translated into Hebrew for use by staff at the Israeli center. The manual is being translated into Arabic and Russian to serve the needs of Arabic- and Russian-speaking staff and members of the Jerusalem-based facility. “Hadassah College is open to everyone,” explained Adler. 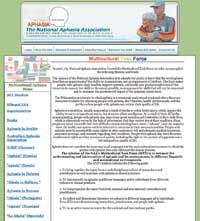 The National Aphasia Association’s Multicultural Task Force has prepared a “Multicultural aphasia menu” with links to brochures in many languages, including Arabic, Russian and Hebrew. The brochures can be found at: www.aphasia.org/naa_materials/multicultural_aphasia.html.